A physician I work with has been doing much research lately and he recommended a book to read. Even though this book has NOTHING to do with people who have intellectual/developmental disabilities or issues regarding advocacy for I/DD – it did have very relevant information regarding facts vs belief. Over eighty years of scientific and peer reviewed research has been replicated and consistent. The researchers agreed and still agree with the facts of the scientific research. The problem though is that the “authorities” who make public policy came to believe something else and as a result, nothing else matters. They either ignored or actively rejected the science because they didn’t like it. “Imagine you’re serving on a jury. The defendant is accused of some heinous crime. The prosecuting attorney has evidence that he says implicates the defendant beyond reasonable doubt. He says the evidence is as clear as day and that you must vote to convict. This criminal must be put beyond bars, you’re told, because he’s a threat to society. The defense attorney is arguing just as vehemently that the evidence is not so clear-cut. The defendant has an alibi, albeit not one that’s airtight. There are fingerprints at the crime scene that don’t match the defendant’s. He suggests the police may have mishandled the forensic evidence (the DNA and hair samples). The defense argues that the case is not nearly as definitive as the prosecutor has led you to believe. If you have reasonable doubt, as you should, you must acquit, he says. If you put an innocent man behind bars, you’re told, not only do you do the person an incalculable injustice, but you leave the guilty party free to strike again. In science and law, we are expected to ask questions, ask if the evidence actually supports what we are told to believe. We can ask if we are hearing all the evidence or hand-picked and prejudiced evidence. But unfortunately, in public policy, the expectations are not in line with science and law. Many times public policy is based only on beliefs, beliefs which are not backed up by evidence but beliefs which many think are facts. This is most unfortunate and harmful – this “sticking our heads in the sand” and pretending unsubstantiated beliefs are facts and making policy on these misguided beliefs. Cognitive Dissonance is the name of the game in DD advocacy – how do we overcome this? One would like to think that when presented with facts which would prove one wrong, one would be able to accept those facts and change one’s beliefs – but that’s not what happens. When presented with contradictory facts from our beliefs we adhere even more strongly to our original belief. Why is this? How does one even get the facts “out there” for policy makers and administrators to examine when they already believe they have the facts? Why we get fat and what to do about it/Gary Taubes. How can we have stability and sustainability with up to 45% staffing turnover? Stability and sustainability are critical to adequate care for everyone and most important for our most vulnerable. 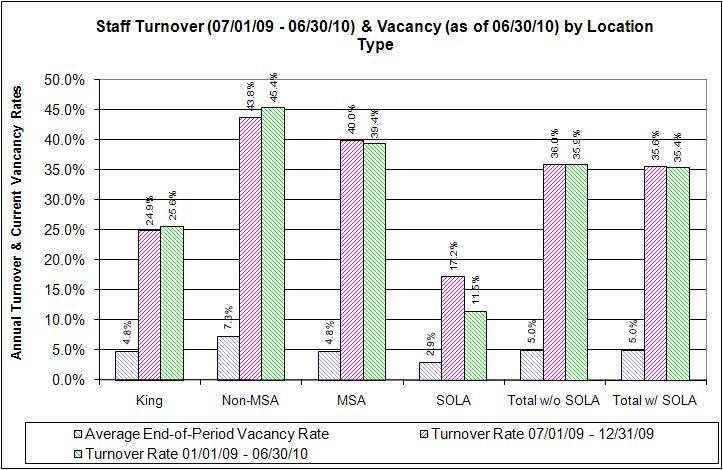 With staffing turnover rates of up to 45% where is the stability for those who most require it? This is the graph from the Division of Developmental Disabilities survey. King County has higher wages than the surrounding area – maybe this explains the lower turnover rate? SOLA’s are state employees and this setting does provide more stability in staffing when compared to non-profit and private supported living homes. 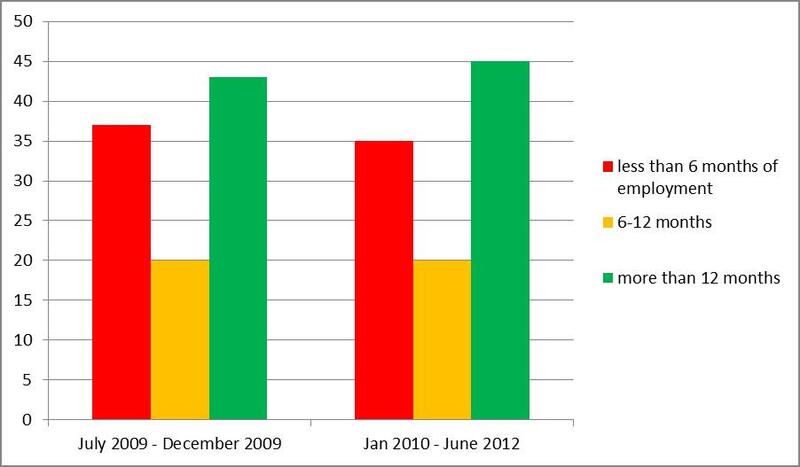 The graph below is taken from the same survey which indicates the high rate of staff leaving within the first 6 months of employment. What does this rapid cycling of new staff not only do to the clients but how does it affect the training and staffing costs to the agencies? Why are these people leaving so quickly? Is it lack of training, lack of support, inadequate orientation, poor fit to the job, poor wages? It is interesting to see the profits of some of these agencies – I can only wonder what the above graphs could look like if some of these agencies with large profit margins could increase the wages of the caregivers just a tad – would that help reduce this rapid cycling of staffing turnover? Maybe just by slowing the turnover rate a bit the training and education costs would also decrease so the profits may not actually decrease – wouldn’t that be a win-win situation for all? This is just wishful thinking in my part, I’m sure but I still can not help but think that it could be a possibility? What do you think?